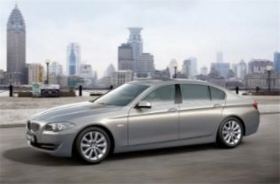 BMW made the wheelbase 80mm longer on the new 5 series for China. SHANGHAI – A locally built long-wheelbase version of the BMW 5-series sedan will make its world debut at the upcoming Beijing auto show. Produced in BMW AG's joint venture plant in the northeast China city of Shenyang, the new model has a wheelbase of 3108mm (122.4 inches), which is 80mm longer than the standard version of the BMW 5-series sedan, the company said. Overall, the new car is 5039mm long, 1860mm wide and 1464mm tall. The 5-series variant is the latest among a series of extended-wheelbase light vehicles that global automakers have developed to meet Chinese consumer preference for a spacious, comfortable rear-seating area. Other international models available in China with a stretched wheelbase include the Audi A6, Audi A4, Mercedes-Benz E class and Volvo S80. Besides the new BMW 5-series sedan, BMW will display three new production models in Beijing – the updated BMW 3-series coupe and convertible as well as the new BMW X5 large premium crossover. The German automaker also will show two concept models -- the BMW Concept ActiveE and the BMW Vision EfficientDynamics.